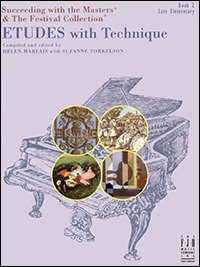 In Book 3 of Etudes with Technique, new techniques covered include: five-finger patterns and octave scales; independence of hands; triads and inversions; trills; chordal playing; and two-note slurs. 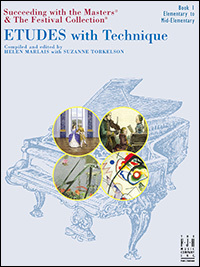 Each technique is supported by several etudes to thoroughly exercise the technique. This book is correlated to The Festival Collection®, Book 3, and Succeeding with the Masters® Volume One. 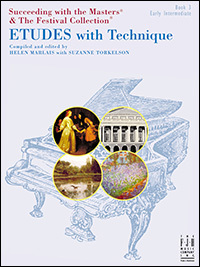 Most of the 28 etudes written by illustrious teacher-pianists (Gurlitt, Le Couppey, Türk, Beyer, Streabbog, Czerny) are two pages long. 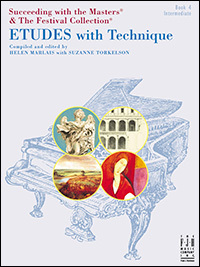 The selections reinforce technical concepts, but they are not just “exercises” but delightful pieces that can be programmed for recital or performance. 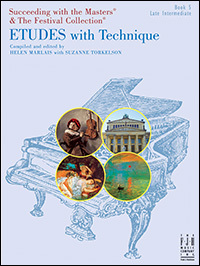 Unit 1 focuses on Trills; Unit 2–Crossovers; Unit 3–Double Notes; Unit 4–Blocked and Broken Chords; and Unit 5–Waltz Bass.